Whenever you go flying, your aircraft takes off from and lands on a runway that has a two-digit number, and maybe a letter, painted at each end in characters that are 27 feet tall. But what do those numbers and letters mean? In the earliest days of aviation, planes took off and landed from an airfield, so named because it was nothing more than a big grass field that could be used for takeoffs or landings in any direction. When a pilot wanted to take off, he simply checked the windsock and pointed his plane into the wind, since a headwind helps generate lift and allows for shorter take off runs. Likewise, landing into the wind permits lower landing speeds and shorter landing distances. As airfields became formalized, it was common to see three runways laid out in a triangle, so crosswind landings and takeoffs could be avoided. But, as airplanes became larger and heavier, paved runways became necessary, and there just wasn’t enough room to fit all those different-direction runways into the same place and handle the greater amount of traffic. Parallel runways became necessary, so two or more runways could be used at the same time. Since taking off and landing into the wind is preferred, airport designers study the weather and the prevailing winds at the location where they want to build an airport. Then they collect the data into what is called a wind rose, similar to a compass rose, to determine the prevailing wind direction and speed. The runways are then oriented to take advantage of the wind for most months of the year. Below is an example of a wind rose for Austin, Texas, with data collected over an 8-year span. From this data, we can see that the wind blows out of the south or south-southeast for a majority of the year, mostly during the warmer months. 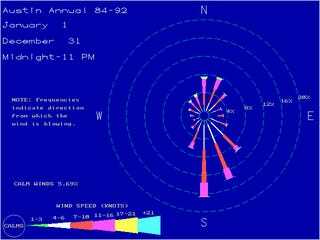 When cold weather fronts blow through Austin, the wind usually shifts out of the north or northeast, and this is shown on the wind rose. Today, Austin-Bergstrom International Airport (KAUS) sits on the location of Bergstrom Air Force Base, which opened in 1942. Like other airfields of its era, Bergstrom had a traditional triangle of runways. But when it became a Strategic Air Command base in 1948, long runways were built to accommodate the new generation of heavy jet bombers. Based on the prevailing winds in Austin, those two long runways were built almost due north-south. Below is what KAUS looks like today, with its two parallel runways. The giant numbers painted on the ends of the runways at KAUS are 17L (seventeen left) and 17R (seventeen right) if you are taking off or landing to the south, and 35L and 35R if you are taking off or landing to the north. These numbers, and the numbers on all runways that follow guidelines set up by the International Civil Aviation Organization (ICAO), are determined by the magnetic compass heading of the runway in the direction of travel. Since degrees of a circle go up to 360, the third digit is dropped, and all headings are rounded to the nearest 10. So, runway 17 has a bearing of 170 degrees, while the reverse runway, 35, has a bearing of 350 degrees. (Notice that the difference between 17 and 35 is 18, or 180 degrees.) A runway of less than 100 degrees would be labeled 9 for 90 degrees, or 8 for 80 degrees, and so on (other counties, like the UK, use two digits, such as 09 or 08). The designation of L or R for left or right is determined by the relative position of the runways to each other, based on the direction of travel. A single runway will have only the compass heading painted on it, since its not to the left or the right of anything. But what about airports that have more than two runways? For airports with three runways, they are numbered as usual then designated L, C and R for left, center and right, based on the direction of travel. And, if an airport has four (or more) parallel runways, one set of runways will be designated one digit (ten degrees) off from the other to avoid confusion. Let’s take a look at this runway map of Dallas-Fort Worth International Airport (KDFW). We can see that the four main runways run north-south based on the prevailing winds in the area. The two runways on the west side of the airport are designated 18L/18R and 36L/36R (truly North-South at 180 and 360 degrees), while the three runways on the east side of the airport are designated 17L/17C/17R and 35L/35C/35R (10 degrees off, though they are actually parallel to the runways on the other side of the terminal). The two shorter runways running NW/SE are designated 13L/13R and 31L/31R (130 degrees and 310 degrees). So, runways are numbered based on their magnetic compass reading, but what about the fact that magnetic north (as opposed to true north or geographic north) is always moving? As magnetic north wanders under the influence of the Earth’s core, runway designations may need to change with it. Since the runway directions are rounded to the nearest 10, it would take a significant change in magnetic north to affect the runway numbering. For example, a runway that lies at 228 degrees will be designated 23 (for 230 degrees), and even if the magnetic pole moves to a point where the runway is lying at 232 degrees, it will still be rounded to 230 and remain runway 23. But sometimes, enough change in magnetic north occurs that runways must be renumbered. Though such occurrences are rare, they do happen. In 2009, the single runway at London Stansted Airport (EGSS) changed from 05/23 to 04/22 due to a shift in magnetic north. But these changes, even if necessary, aren’t popular. Any time a runway designation changes, the runway must be closed to have the numbers repainted, directional signage for taxiing aircraft must be changed, and navigational charts must be reprinted to reflect the new heading. Fortunately for London Stansted, it is estimated that it will be at least 48 years before another change in runway heading may be required.